Ever since starting my blog, I had heard good things about Edith Wharton. She wasn't an author that I had heard of before then despite being what one could class as a "classic" writer. Considering that the praise for her writing was immense from the blogs that I followed, I thought that it might be an idea to try out one of her books that I had seen particularly touted, The House of Mirth. The House of Mirth follows Miss Lily Bart, a beautiful young woman who seeks to climb the ladder of her social circle amongst New York's nouveaux riche. Brought up with a strict aversion to dinginess despite her family's comparatively modest means, she aims to marry a husband who can provide her both with luxury and endless admiration. She finds herself, however, meeting a succession of obstacles born out of missteps of conduct that would be harmless enough were her peers not morally bankrupt to one extent or another. I already mentioned that I had heard good things about Edith Wharton's books, but damn could that lady ever write. It has been a long time since a book has been well-written enough that I have been so torn between putting it down because it's too tense, and continuing reading because I need to know what happens. 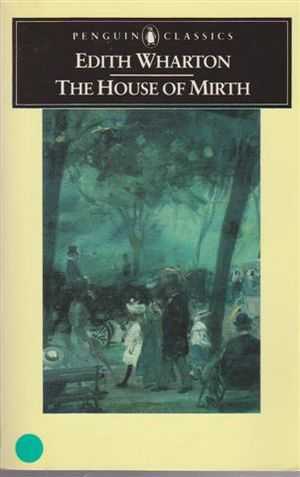 Admittedly, I do have a weakness for books that fall into the comedy of manners, especially those that are particularly sharp and backstabbing, but there is something particularly engaging about The House of Mirth. I believe that the key to its success is the main character, Lily Bart. She is the feminine epitome of the classic tragic hero: have a particular flaw that causes her to make a mistake great enough that she suffers a great fall and enough pride that she cannot undo the mistake once she has made it. What makes Lily interesting is that her flaw is essentially that she has scruples. At the beginning of the novel, she knows that in order to attain the wealth that she wants, she needs to act in a certain way to attract a particular rich gentleman. But she fails at the last hurdle because she finds herself unable to tolerate the idea of the vapid life that she would lead as a result, always having to keep up these lies in the process. And this continues throughout the novel: she meets an obstacle or fixes on a goal, gets most of the way there through scheming and manipulation, but is brought up short by an abhorrence towards the very underhanded tactics that can only benefit her. It's a fascinating inner struggle to watch, but certainly not an easy one to stomach at times. Towards the end, it also becomes increasingly obvious what the end has to be, but it is no less enthralling because of that .